From the critically acclaimed author of The 25th Hour and When the Nines Roll Over and co-creator of the HBO series Game of Thrones, a captivating novel about war, courage, survival — and a remarkable friendship that ripples across a lifetime. By turns insightful and funny, thrilling and terrifying, the New York Times bestseller City of Thieves is a gripping, cinematic World War II adventure and an intimate coming-of-age story with an utterly contemporary feel for how boys become men. David Benioff was born and raised in New York City. He adapted his first novel, The 25th Hour, into the feature film directed by Spike Lee. With many other screenplays to his credit, he is also the writer of the films, "Brothers" and "X-Men Origins: Wolverine". Stories from his critically acclaimed collection When the Nines Roll Over appeared in Best New American Voices and The Best Nonrequired American Reading. His latest novel is City of Thieves. He lives in Los Angeles with his wife and daughter where he is a co-creator and writer for the HBO hit series "Game of Thrones." 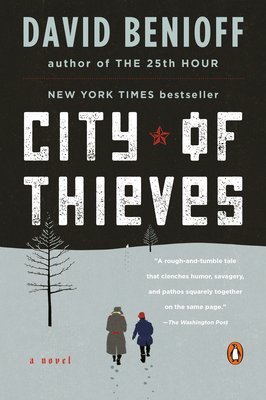 "City of Thieves is a coming-of-age story brilliantly amplified by its worn-torn backdrop . . . Benioff’s finest achievement in "City of Thieves" has been to banish all possible pretensions from his novel, which never wears its research on its sleeve, and to deliver a rough-and-tumble tale that clenches humor, savagery, and pathos squarely together on the same page."